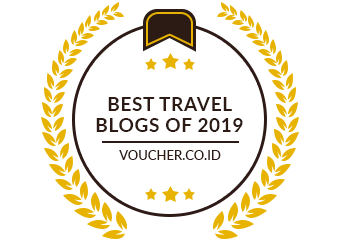 Someone read my article “Jackie, orangutan who owns a house” and asks, “does orangutan really live in house?” Definitely not! 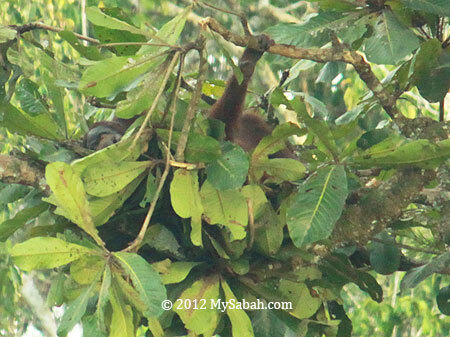 Orangutan spends its night by sleeping on the tree. 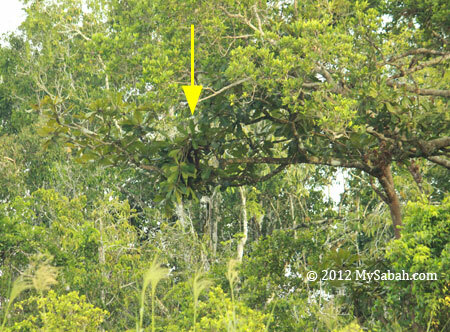 As this great ape weight about 50 to 100 Kg, it needs something to support its body, so it builds a nest. 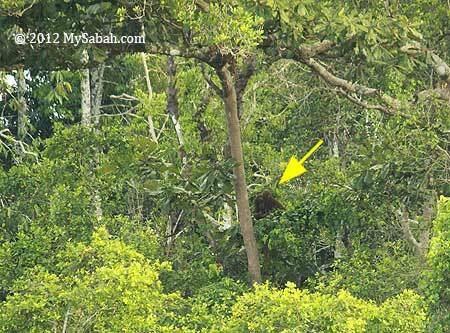 If you walk in Borneo rainforest, you would see huge nest high on the tree. 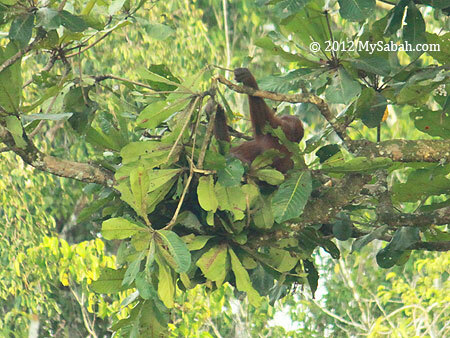 It can be the “bed” of the orangutan. 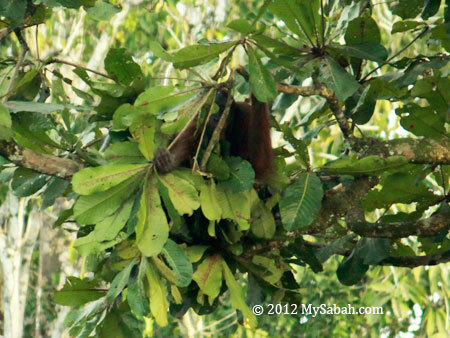 To estimate the number of orangutan population, researchers will count the number of orangutan nests. 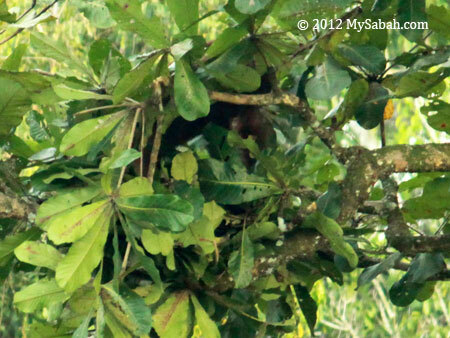 Other great apes such as gorilla and chimpanzee also build nest. In fact, orangutan is the largest arboreal animal in the world. 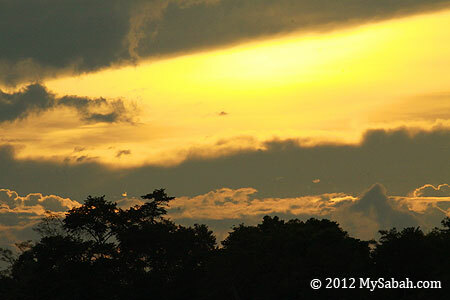 Last month I was on a river cruise at Kinabatangan River nearby Abai Village around 5PM. Suddenly my tour guide exclaimed, “Look! That’s a orangutan!” It was so far away that it took me some effort to spot this adult orangutan on top of a tree at river bank. I had seen semi-wild orangutan in Sepilok Orangutan Rehabilitation Centre and Lok Kawi Wildlife Park, but I only saw wild orangutan a few times. 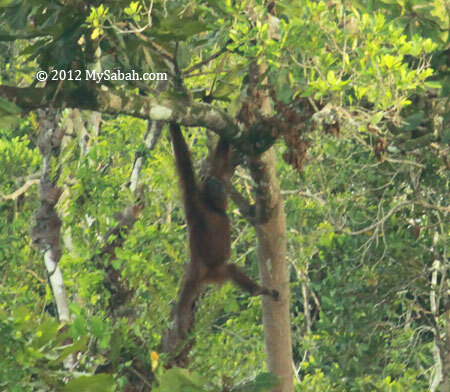 Our boat approached the tree of this orangutan slowly and quietly for closer look. Then it started to climb. “Oh no! It must have seen us and want to flee..” I thought I would lose sight of it very soon. Wait… It stopped on a big branch and started bending branches. Laran (species: Neolamarckia cadamba) is the favorite tree of orangutan for making sleeping nest, so the villagers start to plant more Laran near their places, to promote conservation and nature tourism. Not every tourist is lucky to see this. I was so excited! It was my day. 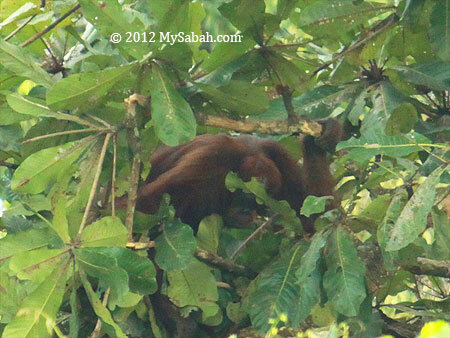 Orangutan is a tree dweller. It spends most of its time on tree, from foraging, feeding to sleeping. 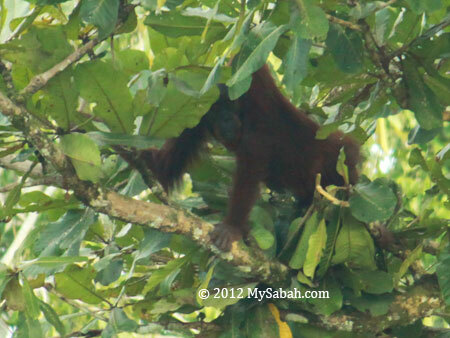 To avoid predators such as Clouded Leopard and Sun Bear, orangutan seldom comes to the ground. That’s why forest is an important habitat for orangutan, and that’s why they become endangered species, after people cut most of the rainforest. 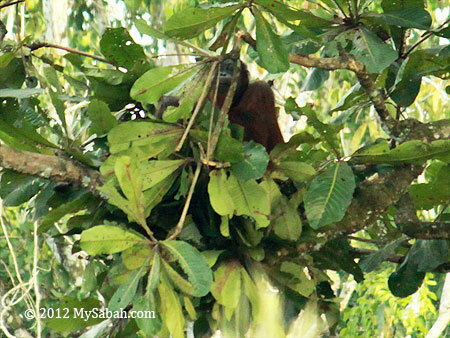 Tree is a Home to orangutan. It was folding bigger branches to form a nest scaffold for its bed, then bending down and weaving small branches to form dense leaf covers on top and bottom. Its skill was so sophisticated that a tree bed was constructed within 15 minutes. At last it laid down and made itself comfortable. According to a research by scientists at the University of Manchester, orangutans show engineering skills when building nests. 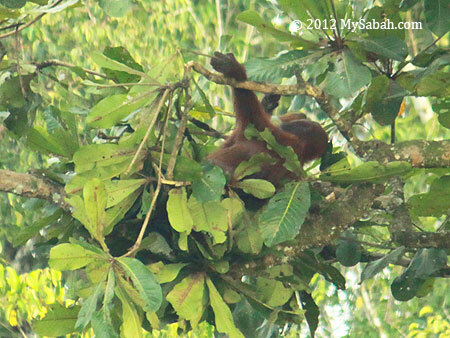 Orangutan chooses tree with good structural support for its nest. This is an intelligent decision rather than a random selection. It knows how to use strong branches as base and thinner branches for a springy mattress. 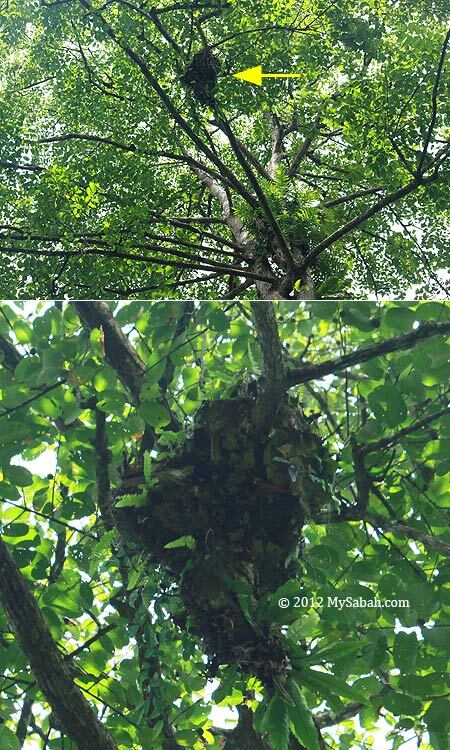 To take advantage of the flexible branches for making of a tent-like nest, orangutan bends, but does not break the branches and twigs, to keep them attached around. 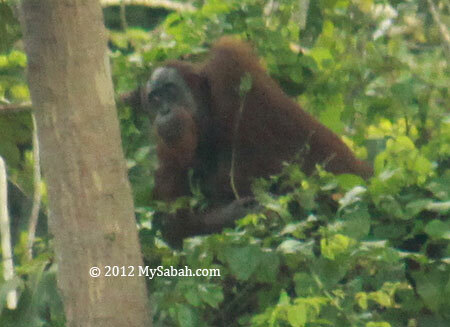 Again, orangutan impresses me… Good Night orangutan!